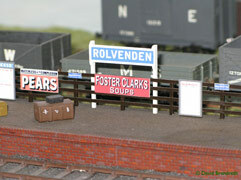 Rolvenden is based closely on the station of that name on the Kent & East Sussex Railway. Whilst trying to capture the atmosphere of the line in the 1920's, the track plan has been adapted to fit the baseboard and is not slavishly copied. 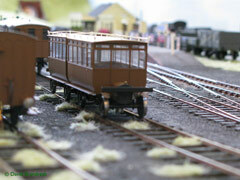 The K&ES is a light railway, which is reflected by the use of much light flat bottom rail, and sidings ballasted with ash. 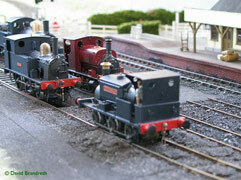 The through line was relayed with second hand bullhead track in the 1900's as on the layout. The level crossing has a working single gate. Little maintenance means the sidings are overgrown with weeds, the through line has lost its cess-path; though the lime stone ballast is reasonably weed free. 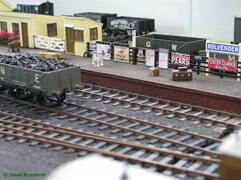 Trains are run from a cassette fiddle yard to an automatic two-road turntable at the other end. Trains can cross in the passing loop just off the end of the platform, many are mixed and the passengers have to wait while the wagons are shunted. This it Rolvenden's first outing, it still has much to be finished; I hope you enjoy what has been achieved so far.